Monterey Bay and surrounding waters are prime habitat for white sharks. The same adult white sharks visit this part California annually over decades, mostly during fall and early winter. Farther south, from Santa Barbara to Central Baja, white shark babies, or pups, typically spend their first years in warmer “nursery” waters. 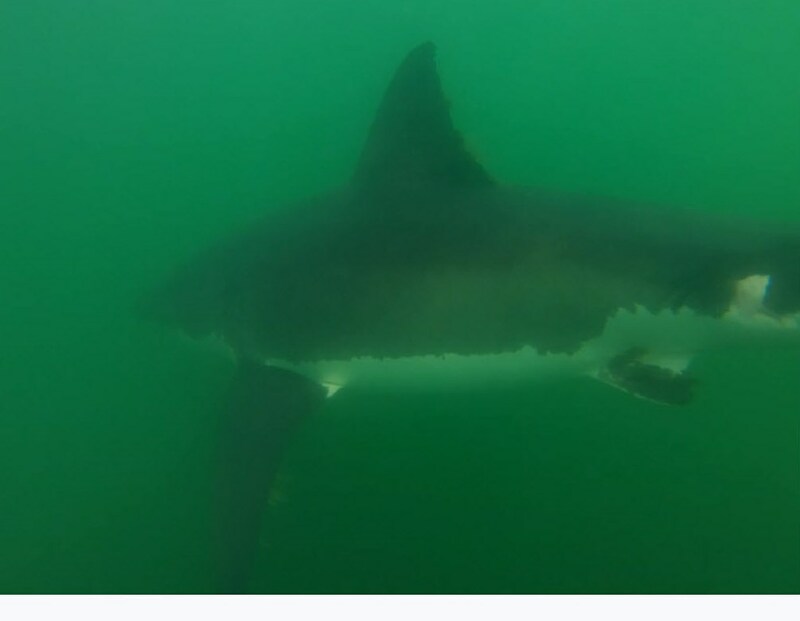 What’s new and surprising, though, is that in recent years a seasonal group of younger white sharks has established itself within sight of the beaches at the north end of Monterey Bay. Is this new cohort taking up residence as a result of warming ocean conditions? And why are the sharks aggregating in one portion of the bay? That’s what Monterey Bay Aquarium research scientist Dr. Sal Jorgensen and his colleagues hope to determine in the coming months. 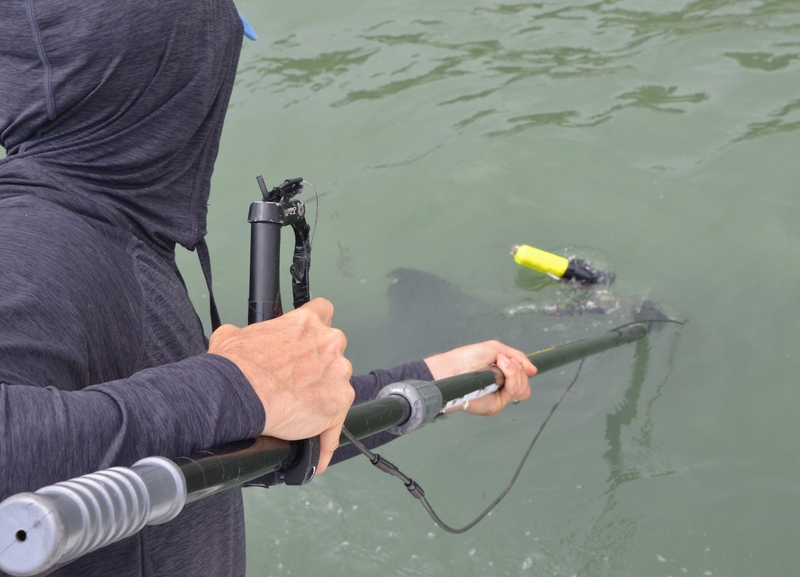 Sal and the Aquarium’s white shark research team, in collaboration with scientists at Stanford University, Cal State Long Beach and other partners, have been tagging and tracking adult and juvenile white sharks in California for nearly two decades. 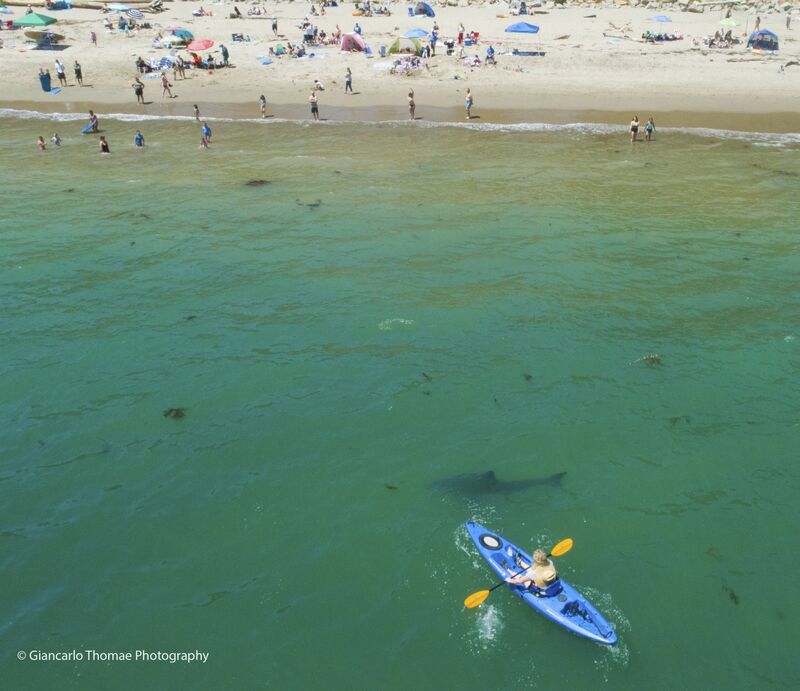 Over that time, they’ve documented the regular comings and goings of adult white sharks along the Central Coast. 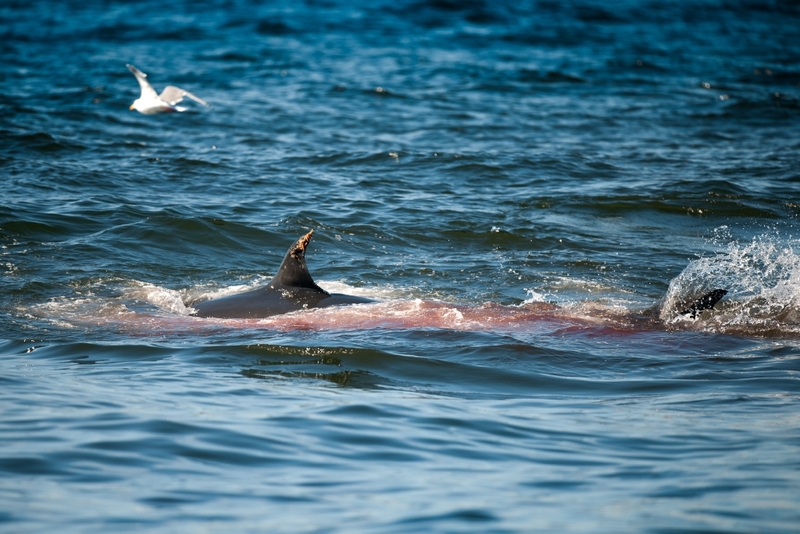 Adults tend to appear in coastal waters in late summer and fall and feed on seals and sea lions where these marine mammals haul out onto the shore in large rookeries. After gorging for a few months, most of the large white sharks head offshore in winter and spring to the the White Shark Café. Adult white sharks return to the California coast in late summer and fall to feed on seals and sea lions. By spring, most have migrated far offshore. Researchers have also tracked coastal migrations of the youngest white sharks between Southern California and the Baja Peninsula, where they can find abundant fish to feed on and warmer water to help them maintain their body temperature. As these sharks grow larger, they can better tolerate cold waters and expand into more northerly habitats to access larger prey. The seasonal appearance of younger sharks near swimmers and kayakers around Seacliff State Beach in Aptos is a recent phenomenon that doesn’t fit the pattern. Sal thinks he knows why they’re here, and has begun testing his hypothesis. Once the juvenile sharks followed the warm water north from their usual habitats, they may have remained in the bay during the subsequent El Niño years, he says—periods also characterized by warmer-than-usual sea temperatures. They may have been “trapped” in the bay, unable to traverse cold water on the outer coast between Monterey Bay and their typical Southern California habitat. Alternatively, he says, they may just have imprinted on this area. Young white sharks in Monterey Bay remain near the surface. Their location and swim pattern indicates they may be cruising in surface waters to warm themselves. The aggregations near Aptos coincide with spring and summer periods when Central Coast waters cool down, due to wind-driven upwelling of deeper, colder ocean water. When water temperatures plummet along the outer coast, there is usually a persistent small pocket of warmer water off the coast near Aptos, Sal notes. Temperatures there can range up to 10 degrees warmer, making them more to the small sharks’ liking. Small white sharks have a harder time maintaining their core body temperature and, he says, some of these animals are tiny—barely larger than their typical birth size (around 4.5 to 5 feet); others are probably a few years old. Once they begin to reach adulthood, around 11 feet for males and 13 feet for females, they will most likely start migrating to offshore waters with other adults in the spring and summer, Sal says. Taking advantage of warmer water? 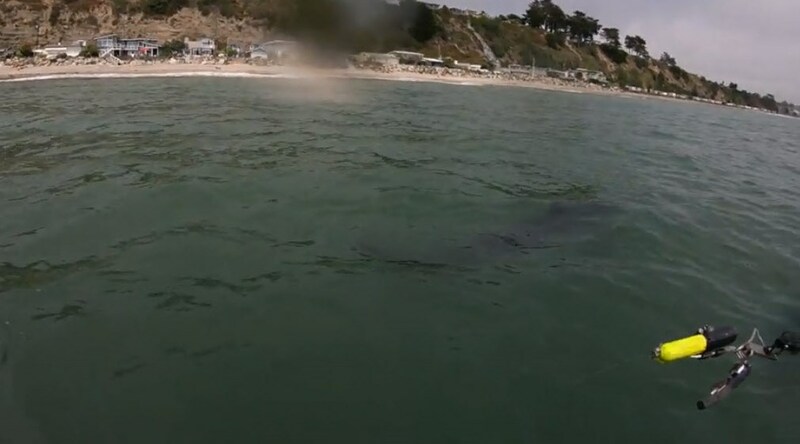 The behavior of the sharks near Aptos, swimming slowly at the surface, suggests they are warming their bodies, a process known as thermoregulation. When adult white sharks patrol in the vicinity of nearby seal colonies, they typically swim close to the bottom where they would go unnoticed by their prey. Research scientist Dr. Sal Jorgensen prepares to attach a camera tag to the dorsal fin of a young white shark in Monterey Bay. “Animals that are hunting wouldn’t swim at the surface like this,” Sal says. Sal wants to learn more about the changing distribution of these small sharks, and test his hypothesis that they’ve found a local “thermal refuge.” For this the Aquarium team has secured research permits and begun fitting the sharks with electronic tags. The team is comparing tagging and survey data with sea surface temperature maps generated by satellite sensors. The sharks’ presence near to swimmers and kayakers has prompted periodic warnings and beach closures. While this is a new phenomenon for Monterey Bay residents, sharing swimming space with juvenile white sharks is a normal occurrence in Southern California, Sal notes. This year, the California state budget includes funds to expand research tagging and monitoring programs to help address growing public awareness that young white sharks are swimming just outside the surf zone in the most populous part of the state. Statistically, the risk of a shark bite has fallen by 90 percent in California since the 1950s. Using common sense in the water can keep the odds low. Sal says it’s always prudent to exercise caution around wildlife—on land or in the sea. He’s quick to add that few shark encounters result in injury to people. It’s a fact he and his colleagues documented in research they published in 2015. They found that the odds of being bitten by a white shark in California have gone down nearly 90 percent since the 1950s. More people than ever are in the water for recreation—swimming, diving, surfing, kayaking and spearfishing—while the number of shark bites has barely risen. Learn more about the Monterey Bay Aquarium’s white shark research program. Thanks, MBA. Now please tell us: when does a white shark become a Great White Shark???? They’re always great! Scientists prefer the less dramatic white shark.